Sterling silver 5/8" framed discs with decorative scroll at the top. 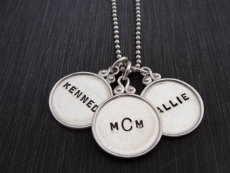 The discs are high polished silver and can be stamped with block, script or lowercase font. The discs are hung on sterling silver ball chain, which come in 16",18" or 20" lengths.